Brian Pilcher’s nightmare moment turned into a dream ending on Sunday. The retired 59-year-old real estate financer from Kentfield envisioned an “amazing” scenario whereas 45-year-old Matias Saari of Anchorage, Alaska would catch and pass him to win the 106th Dipsea, yet Pilcher, despite falling about 2.5 miles from the finish, held off his rival for the second year in a row to claim his third Dipsea championship trophy. 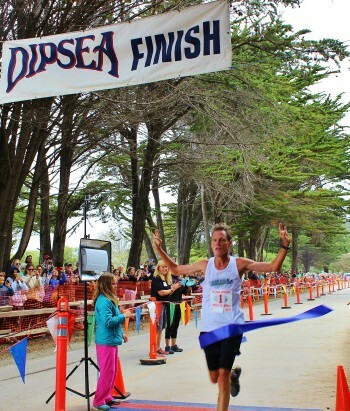 Pilcher became the first male runner in 20 years to repeat as Dipsea race champion in the historic 7.5 mile trail race. Joe King, then 70 years old, won back-to-back Dipseas in 1995-96. With an 11-minute head start (including a one-minute “champion’s minute”), Pilcher managed an actual race time of 57:28, only 33 seconds slower than his winning time last year, but still a rare feat for a Dipsea runner to post a time lower than his age. In addition, Pilcher’s victory elevated him into an elite group of Dipsea champions. Sal Vasquez, Shirley Matson, Russ Kiernan and Melody-Anne Schultz are the only other runners to win more than two Dipseas – and all four of them are in the Dipsea Hall of Fame. On Sunday, after Cardiac Hill, the highest point on the Dipsea course, Pilcher figured he was in great position for Dipsea Victory No. 3. But suddenly he inexplicably stumbled and fell on a flat path soon after. He thought that miscue tripped the odds of winning toward Saari, who had a four-minute head start and a reputation for being a fierce downhill runner. Once Pilcher passed 76-year old Hans Schmid of Greenbrae, the 2012 Dipsea champion, and two-time race winner Jamie Rivers of Mill Valley before entering the treacherous “Swoop” section on the course, he took the race lead for the first time. Schmid wound up becoming the oldest runner to win a coveted Dipsea black T-shirt and Rivers, 65, was the first female finisher, but, to Pilcher, Matias was on his mind, yet not on his heels. After finishing 1:58 behind Pilcher last year, Saari was 58 seconds off Pilcher’s winning pace this year. It was instead 63-year-old Heath Hibbard of Montrose, CO. He finished third overall, ahead of 50-year-old Darrin Banks of Berkeley and 35-year-old Rickey Gates, now living in Madison, WI. Saari, bidding to become first non-California resident to win the Dipsea since Coloradoan Gail LaDage Scott in 1986 and first male non-California resident to win the race since Australian Joe Patterson in 1975, clocked an actual time of 51:26. That was 33 seconds slower than his Dipsea debut last year. This year’s Dipsea – the oldest trail race in America and the country’s second oldest footrace behind the Boston Marathon – had runners from 32 states from New Hampshire to Alaska plus the District of Columbia and entrants from all the world, including two competitors from Singapore. The youngest runner entered was six-year-old Dante Pasquale of Novato and the oldest were 81-year-old Bill Dodson of Mountain View and 82-year-old Barbara Robben of Berkeley. The first male and female high school finishers were Annika Levaggi of Mill Valley and Joseph Biehl of Juniper Hills, who placed 23rd overall. Jamie Rivers and her husband, 2008 Dipsea champion Roy Rivers, won the Alan Beardall Family Award, while 33-year-old Corey Baxter of Fairfield was the first competitor from the Dipsea Runner’s Section to cross the finish line with a time of 54:20. Fiona Cundy, 29, of Oakland was the Fastest Female Time Award winner (58:44) and 30-year-old Gus Gibbs of Ketchum, ID, who placed ninth overall, won the Fastest Time Award with a scratch time of 49:23. Gibbs and Saari, Gates, Galen Burrell, and Alan Reynolds combined as Pelican Inn Track Club teammates to win the Team Trophy for the third consecutive year. The late Jerry Hauke, who was instrumental in the preserving and developing the Dipsea race, was named the recipient of the Jack Kirk “Dipsea Demon” Award for dedication, perseverance and performance over time. His son, Randy, accepted the award. Steve Stephens, one of only three runners in Dipsea history to win at least 20 black T-shirts for finishing in the Top 35, received the Norman Bright Award for extraordinary effort in the Dipsea Race, and longtime volunteer Bruce Linscott was the recipient of the Red Tail Hawk Award, also known as the Jerry Hauke Perpetual Award, for leadership, dedication and sportsmanship.